After Nyasaland gained it’s independence from Britain in 1964, the country became know as the Republic of Malawi. The small landlocked East African nation is bordered by Zambia to the northwest, Tanzania to the northeast, and Mozambique on the east, south and west. During British rule, very few local artists would gain prominence due to the oppressive colonial regime. After the country’s independence, the most prevalent music on the radio was Western Pop, Congolese Soukous and East African music. But due to the 1968 Censorship Act, Malawian musicians had to write lyrics acceptable to censors to ensure that their songs would be played on radio. It should be no surprise that the most popular band in the country became the M. B. C. Band, the house band for the Malawi Broadcasting Corporation – which had a monopoly on the airwaves up until 1994. Formed by Kapote Mwakasungura, Mjura Mkandawire and Wyndham Chechamba in 1973, the band pioneered the modern popular Malawi Sound – mixing indigenous music with foreign influences. Although the band went through numerous line-up changes, they disbanded in 2001. 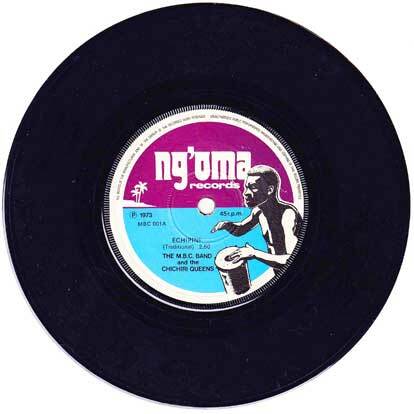 Other than this single, I have also seen a full length album entitled “Kokoliko Ku Malaŵi” on the same label – Ng’oma. As far as I know, The M. B. C. Band and the Chichiri Queens were the only artists on that label that may or may not have been based in England. If you have any further information on the M. B. C. Band and/or the Chichiri Queens, please contact me or leave a comment. Catalog number MBC 001 on Ng’oma Records. Released 1973.